As I am preparing for my first half-marathon race on December 6 at the Standard Chartered Marathon here in Singapore, running has given me enough time to train and think in between. Here are the ten things I learned and benefits I got from running during months of training. An athlete who fails to plan, plans to fail. 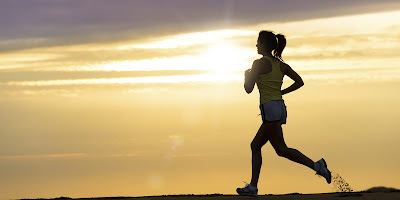 You don't just wake up one day and tell yourself you want to run a marathon, then run for it. You are heading to disaster my friend, and even if you find a way to struggle through the finish line, wait till the next day, when your body screams at you with all the muscle pain and injuries. Never under estimate the power of breathing, this will keep you through the race. Breathing deeply while running can also relieve the pain of side stitches. Find your "sweet spot" speed where your body allows you to run long distance in comfort. Your best intentions will not bring you to finish line, unless you step on that treadmill or path walk and start running. Intentions no matter how good are not enough. Run! Grab a comfortable pair of running shoes for everyone's sake. After all you owe it to your feet. Four months before I registered for the 21 km run, I knew it would be very difficult but it is possible. And "possible" is enough for me, I'll just figure out how to solve the "difficult" part within 4 months of training before the race..
Poor running posture, puts excessive force to your lower body that may lead to injury. Every runner starts at a common starting point but not all make it to the end. You may start fast and strong but that does not guarantee completion. Warm up your body and mind, run comfortably, find your pace and finish well(without injuries please). To plan is one thing, execution is another story. That deliberate course of accelerating the speed, increasing distance or work out hours overtime to build up your endurance pays a lot. Running somehow de-clutters my thought life and gives me a different perspective. Why am I doing this? What really matters? When to stop? Questions that pop in my mind because I am freeing it from its usual worries and concerns. Taking away the unnecessary load allows you to run freely not just in marathons but also in life. Leave all your grudges, fear and insecurities, these will weight you down. Instead run with hope and perseverance, believing that the finish line is just few steps away. Finally if there is single most important thing I learned from running, that is I realized I am blessed. Blessed with two sturdy legs that can take me distance. Blessed with stamina that keeps me going further. Blessed with good amount of discipline to persevere during the training. Blessed with a strong heart that pumps blood and energy to my whole body. Blessed with a vision to look forward to the end knowing that the best is yet to come.